Data-analytic modeling is concerned with estimating good predictive models from finite data samples. This is directly related to the philosophical problem of inductive inference. The problem of learning (generalization) from finite data had been formally investigated in VC-theory ~ 40 years ago. This theory starts with a mathematical formulation of the problem of learning from finite samples, without making any assumptions about parametric distributions. This formalization is very general and relevant to many applications in machine learning, statistics, life sciences, etc. Further, this theory provides necessary and sufficient conditions for generalization. That is, a set of admissible models (hypotheses about the data) should be constrained, i.e., should have finite VC-dimension. Therefore, any inductive theory or algorithm designed to explain the data should satisfy VC-theoretical conditions. 1. An underlying assumption that future data is statistically similar to past data is too narrow. 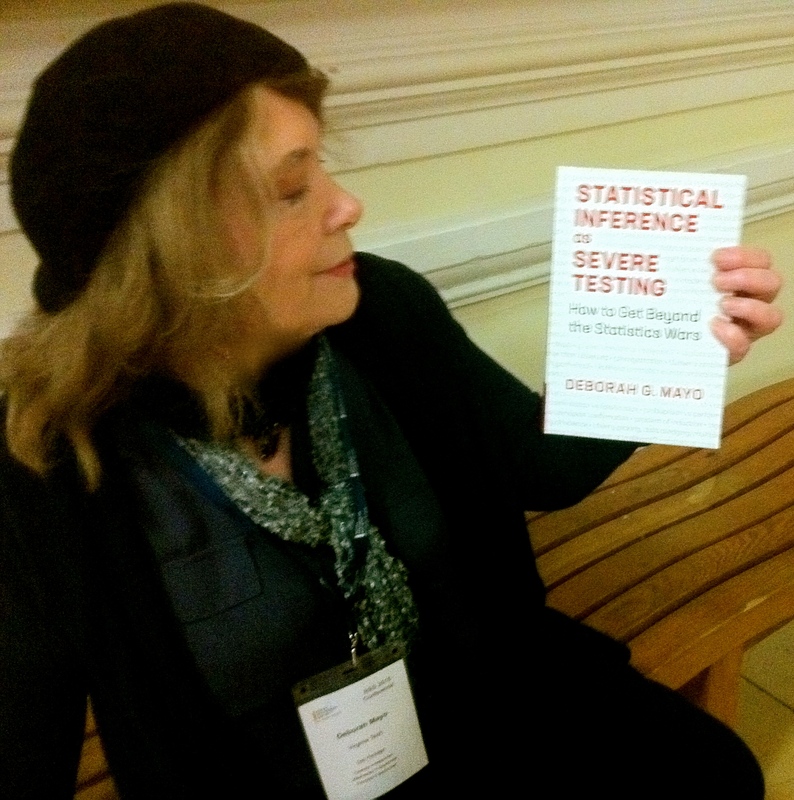 In particular, Deborah Mayo suggested that “statistical science” offers methodologies that enable inductive learning from arbitrarily changing distributions. This assertion is puzzling to me, as I am unaware of any such methods. 2. There exist “better theories.” This assertion is too vague. Certainly, one can hope and strive for better theories. However, in order to be scientifically sound, these better theories have to include the VC-theory as a special case. Clearly, this was not the case with the philosophical theories presented during this workshop. With regard to philosophical interpretation of data-analytic knowledge discovery, my presentation advocated an Instrumentalist position versus Realistic view of classical statistics. My arguments used both pragmatic considerations (following Leo Breiman’s paper, and VC-theoretical results. According to VC-theory, it is not possible to estimate a true model from finite data, whereas it is still possible to estimate a good predictive model. So the Instrumentalist view follows directly from a sound scientific theory, and not from the philosophical arguments. This instrumentalist approach has many philosophical and practical implications for interpretation of data-analytic models—as discussed in my talk. In a more general sense, as noted by Vapnik, the problem of induction is ill-posed. This ill-posedness is the property of the problem itself, not the solution. So realism is not possible, and instrumentalism is an appropriate (technically sound) philosophical position. Vapnik’s observation is very fundamental, and it challenges existing classical statistical methods (maximum likelihood, least squares estimation, etc.). This view, of course, is consistent with his original VC-theory concerned with theoretical analysis of the binary classification problem (i.e., estimating a good rule for discriminating handwritten digits 5 versus 8). Finally, on the importance/relevance of Occam’s Razor for statistical learning. It can be addressed by VC-theory (assuming, of course, that this theoretical framework is adopted by all participants). Namely, inductive inference/ generalization is controlled by the VC-dimension. This complexity index is different from the number of free parameters (or entities) used by statisticians and philosophers to measure the model complexity. Therefore, OR is not relevant for the problem of inductive inference in statistical learning. This conclusion may be discouraging and unpleasant to philosophers. Some philosophers suggested that the OR principle still holds if the VC-dimension is used as a measure of complexity. This semantic game-playing seems counter-productive and only breeds more confusion. Of course, this discussion is limited to data-analytic modeling: the OR principle may still be useful for discovering other kinds of knowledge, i.e., first-principle knowledge. In the course of this workshop, it became evident that there is disagreement/ misunderstanding of the learning problem setting used by statisticians/machine learning researchers and philosophers. Without such a common understanding and agreement on the basic assumptions, it is difficult to have a meaningful technical discussion. VC-theory uses a quantifiable notion of generalization (prediction risk) that originated from Rosenblatt’s perceptron, and assumes standard inductive learning setting. So my and Vapnik’s talks discussed inductive inference, Occam’s Razor, etc., in the context of this setting. Similar settings are also used in most machine learning and statistical methods. Apparently, this learning setting is not familiar to philosophers, and they use a different set of assumptions and concepts. Some philosophers refer to hypothesis testing when they discuss induction and statistical learning. Under this setting, given a set of data points, the goal is to decide whether this data set was generated by a given (probabilistic) model. In contrast, in machine learning, we are given a set of data samples, and the goal is to select the best model (function, hypothesis) from a given set of possible models. This latter (machine learning) view was used in Popper’s discussions on polynomial curve fitting, used for illustrating his ideas on the connection between falsifiability and complexity. Pure logical thinking cannot yield us any knowledge of the empirical world. All knowledge starts from experience and ends in it. Note that Einstein’s quotation does not mention intelligibility or “truth.” Even though Einstein referred to first-principle knowledge, his argument certainly holds for data-analytic knowledge as well. Just to briefly correct two errors: (1) I never claimed that “‘statistical science’ offers methodologies that enable inductive learning from arbitrarily changing distributions,” only that the prediction-classification examples Cherkassky discusses, however important and interesting, are special cases and not the whole of statistical science (much less, all of science). Says Cherkassky: “In machine learning, we are given a set of data samples, and the goal is to select the best model (function, hypothesis) from a given set of possible models.” Fine, but is the background knowledge required to obtain the pieces of this setup, to ensure iid, and so on, itself reducible to prediction-classification problems? I say no, as would any good Popperian. (2) I would never suggest that philosophy guide scientific methodology; on the contrary, I have long argued that statistical science is highly relevant to the problems of induction and evidence-transcending inference that philosophers care about. However, the suitability of an instrumental philosophy for machine learning is no argument for a general instrumental epistemology or metaphysics. I may have more to say on this later, but for now I will leave it as open to readers’ comments. [i] See https://errorstatistics.com/2012/06/26/deviates-sloths-and-exiles-philosophical-remarks-on-the-ockhams-razor-workshop/. Several other subsequent posts follow up on the “Foundations of Simplicity” theme. 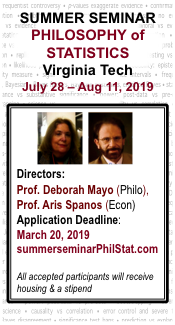 •	Statistical Science and Philosophy of Science: Where Do (Should) They Meet in 2011 and Beyond? I strongly endorse the idea that philosophical problems of knowledge can derive valuable insights from statistical methods—including way to understand and solve the problem of induction (namely, by showing the existence of reliable methods and ways to assess and control the severity of tests). It is this idea that drew me to statistics as a graduate student and that I have been developing and promoting ever since. I can, however, imagine the chagrin of the philosopher who decides for the first time to have a look:“Okay, Mayo, I’m taking your advice to see what statistics has to offer,” and is told that the upshot of all these methods is that one can make reliable inferences from observed to unobserved cases just when it is reliable to do so. To the philosopher’s ears, that is what Cherkassky sounded to be saying in his talk. After a laugh, he or she would resume trying to justify the straight rule based on “inductive intuition” (from all observed A’s have been B’s to the next or most A’s will be B’s). My concern is that this yields too much to philosophical skepticism—though I’m fairly certain that wasn’t the intent. Maybe I misread him above, but it sounded like he was accusing you of wanting to put the philosophers in charge of scientific/statistical methodology using philosophical theories of induction, etc.! Which is pretty strange, even humorous, because in everything that I’ve read of yours so far (especially Error and the Growth of Experimental Knowledge), you are always imploring philosophers to look to standard statistics and statistical methods to get insight into how to solve their philosophical problems like induction, Duhem’s problem, etc.! Eileen: We had not met before, and I doubt he is familiar with my work—but that is one of the valuable things about interdisciplinary conferences. I also think there is some ambiguity between the “philosophical basis” or rationale for a statistical method, in the sense of how to interpret and justify it in relation to given aims (something practitioners would presumably possess) and a general philosophy of science or knowledge (something philosophers would have). I have tried to distinguish these (e.g., Mayo and Spanos 2011, “Error Statistics,”). I’m actually unclear as to why machine learners would care to foist a general instrumental metaphysics or epistemology onto philosophers.There is an endorsement of Popper, or so it seems, but Popper was a realist,and would recoil at such instrumentalism. As to “which came first, the observation or the hypothesis?” Popper held it was always a hypothesis. To me what Cherkassky writes sounds far too much like “prediction is the only game in town”. I think it’s not. Christian: True, that’s what I was trying to say at the conference, but he wasn’t having it. It occurs to me, though, Christian, that your area, cluster analysis, must have a lot in common with the machine learning classification tasks. Do you work with them? Are they rediscovering some of the results from your field, or is it very different? I’d be interested to know what you think. Mayo: This is a question I just have to deal with, writing an overview paper about how to select a good cluster analysis method. Currently the majority of work suggesting new methodology is from the machine learning community. There is also a fair amount on cluster validation and comparison of methods. I’m rather impressed (and scared, because I should take much of it in) by the amount of promising methodological work they produce. They have certainly passed the state of just rediscovering stuff; in some instances I’m amazed by how good it is. However, I also see a tendency in line with Cherkassky’s view of trying to reduce the clustering problem to prediction. Pretty much all papers that they have end with applying the newly suggested method to some kind of standard set of benchmarking data sets with “known truth” in order to evaluate the prediction quality there. Some of the data sets are real ones with “known classes” from supervised classification tasks, other have been generated by mixture distributions. This doesn’t look too bad to a statistician at first sight, but the problem here (missed by many statisticians, too) is that what we are interested in is not necessarily this apparent “known truth”. In real data sets with known classes, there is obviously no real scientific interest in reconstructing these classes, so this does not mimic what cluster analysis is supposed to do in new applications. Also, the “true classes” are usually defined by an external criterion, and there is no guarantee that they are the classes that one would reasonably want to find data analytically if one wouldn’t know them already. The problem with mixture models is that often there is no proper definition of what kind of clusters the method is supposed to find and it is just assumed the there are “natural true clusters” out there, so that the choice of mixture distributions seems rather arbitrary and unmotivated. So I think that they are quite good at coming up with ideas but not so good at defining the problem properly, which may partly be because they lack philosophical thinking. They have pretty good hammers so they try to make the problem look like a really sophisticated nail. Christian: Thanks so much for this. “In real data sets with known classes, there is obviously no real scientific interest in reconstructing these classes, so this does not mimic what cluster analysis is supposed to do in new applications.” This was exactly my suspicion, but when I suggested as much (at the conference) I didn’t get a sense that others agreed, so I figured I was wrong (about cluster analysis). Perhaps you can explain more of what the “new applications” are supposed to do that is not covered. Also, can you please explain briefly “mixture models” in this context? Thanks! What cluster analysis is supposed to do is to find subpopulations that are separated by the rest in data analytic terms, often in the hope that such groups point to some meaningful discoveries, but sometimes also for organisational, communicative and indirect reasons (e.g.,, constructing a meaningful categorical variable out of messy data to use this in order to analyse something else). The task of supervised classification is to find out how the information in the given data set can be used to separate known classes which are defined by other means than the data set used for classification. This means that there is no guarantee that the known classes form data analytic clusters. If you look at gene expression data in order to separate patients with a certain tumor from patient without that tumor, there is no guarantee that these two groups are clearly separated in the data (one would want to find the best classification rule regardless) let alone that this is the best possible partition of the data according to purely data analytic criteria. In the very same data set there may be people with an without another not recorded condition that separates data much better into two classes, so that a clustering method that doesn’t find the given supposedly “true” classes but rather the hidden ones may actually do a better job. That’s the problem with comparing the method’s results with what is supposed to be “ground truth”. I’ll write another posting on mixtrue models. OK, mixture models. A mixture model is a model for a two-step process in which for every data point first a multinomial random variable selects a membership to one of a number of mixture components (although this information is unobserved), and then a data point is generated from a certain distribution with its parameter depending on the component. For example, 0.3*N(0,1)+0.2*N(1,1)+0.5*N(10,10) is a 3-component normal mixture, and one may want to estimate all the component proportions and parameters. In cluster analysis one usually interprets every component as model for a cluster and can then classify points by the estimated conditional probabilities of belonging to the components given the observed data (this is an application of Bayes’s rule but it’s not Bayesian in a philosophical sense). The problem with the way this is used for cluster analysis method benchmarking is that they just select some distributions for the mixture components without discussing how this corresponds to the kind of cluster they expect their method to find. How to do this is far from trivial. For example if you plot the density of 0.6*N(0,1)+0.4*N(1,1), this will rather look like a single cluster than like two of them because it’s unimodal, and if you use this mixture for benchmarking, a clustering method will come out as doing well if it counterintuitively tells you that that’s two clusters. OK, what is used for benchmarking in the literature is rarely as nonsensical as this, but anyway it is usually picked in a rather unmotivated fashion by the intuition of the authors without proper definition what kind of problem their method is actually meant to solve. Thanks Christian. I will have to read up on this, I’m not sufficiently familiar with cluster analysis to reply. Emrah: these are good questions and thoughts. I wish we had taken up more of them at the recent conference. I think the machine learner’s “instrumentalism” is of the naive sense data sort, which is very different from van Fraassen’s constructive empiricism. I think they regard the choices to be between ‘rationalism’ and ‘instrumentalism’ in the old naive sense. See my comment for an explanation. I do think there is something “seriously wrong with instrumentalism as a very general view on large-scale theories of science” because, for starters, scientists are not content merely to predict without understanding things like mechanisms and causes. For seconders, it’s not clear how there could be empirically warranted theoretical knowledge, or large scale theories as even approximately capturing what is the case about such entities as genes, gravity, electrons, etc. according to their conception, as I understand it. As you know, I emphasize experimental knowledge, which some (e.g., Musgrave) had viewed as anti-realist, yet error statistics decides on a case by case basis. But I think your deeper question is quite right: why are they trying to argue from these classification-prediction problems to a general philosophy of science? And even if they do think their work fits instrumentalism, what are they adding to many existing empirical accounts in philosophy of science?